Max Bundle Width : 17.00"
Print manufacturing tends to be a particularly harsh production environment. 24 hour per day production cycles, less than ideal preventative maintenance schedules, paper dust and ink everywhere, and immovable deadlines. Equipment needs to run and run; easily and reliably. Print is where Controls Engineering built the first stretch film bander. Immediate benefits of using the MPT Series stretch film banders in print manufacturing. The MPT Series are designed and manufactured to require NO PREVENTATIVE maintenance. 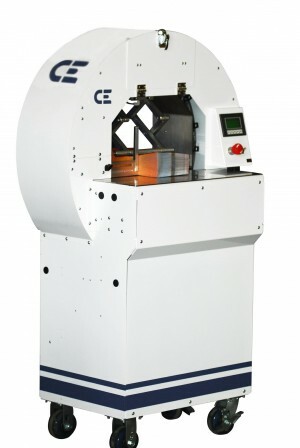 By using the highest quality, precision machined components, each CE Bander can perform even under the most demanding production environments. MPT Series banders are designed, manufactured and assembled here in the United States of America. Industrial grade components, exacting design and manufacturing standards are behind the trouble free operation and performance. At 25-30 bundles per minute, the MPT Series bander will outpace most other banders. 10 second roll changes help keep the bander doing what it does best; keeping your line running. MPT Series banders use 100% recyclable LLDPE banding material that can be comingled with existing stretch film recycling programs.